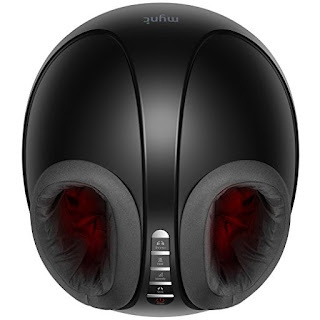 Today ONLY, get this Mynt Shiatsu Foot Massager With Deep-Kneading, Built-In Heat Function, Customizable Air Pressure and Full Foot Coverage From Ankle to Toe for $19.99 (Retail $399.99). -Premium Performance: Hi-tech pads, rollers, and massage technology deliver an immersive, professional-style treatment – from toes, to ankle. -Custom Refreshment: Select heat, intensity and 3 pre-set cycles. 20 combinations provide personalized therapy, aiding relaxation, blood flow and persistent pains. -Tailored Technique: Choose from Japanese shiatsu or powerful air pressure – for a traditional, or modern-style massage. -Design Centric: Faster heating, hygienic foot sleeves and a premium build ensure superior massage and long-term durability. Perfect for use in the home, or office. -What You Get: Premium Foot Massager, Charger, Charging Cable, Owner's Manual, 24 month warranty &amp; fan favorite support.